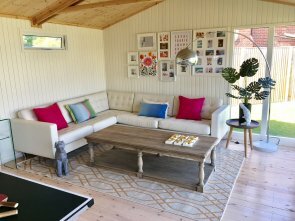 In the past few weeks one of our company partners, and our building stylist spent some time at our Newbury Show Centre to dress a selection of our Sheds, Summerhouses, Studios and Garden Rooms in various styles. We like to dress our buildings to help give customers an idea of what they can do with the space inside their building and help them to decide what size would be best for them. So, whether you want a Garden Shed to use for storage or for potting, a Summerhouse just to relax in, a Garden Studio or Garden Room to entertain or work inside, you can get a real feel for what our buildings can look like and what you can do with them. If you would like to visit our show centre, you are more than welcome to have a wander around the show buildings, and our friendly staff are always on hand to help, whether you just want more information about our buildings and how they’re made, or to discuss your specific building requirements. We also have show centres in Norfolk, East Sussex, Nottinghamshire, Oxfordshire and Surrey.